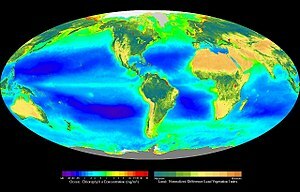 A false-color composite of global oceanic and terrestrial photoautotroph abundance from September 1997 to August 2000, showing Earth's biosphere. Provided by the SeaWiFS Project, NASA/Goddard Space Flight Center and ORBIMAGE. Earth's core – The inner part of the planet, formed by differential buoyancy of the component materials causing the denser materials to accumulate nearer to the centre. Environmental geology – Science of the practical application of geology in environmental problems. Geography – The science that studies the terrestrial surface, the societies that inhabit it and the territories, landscapes, places or regions that form it. Environmental soil science – The study of the interaction of humans with the pedosphere as well as critical aspects of the biosphere, the lithosphere, the hydrosphere, and the atmosphere. Environmental geology – An applied science concerned with the practical application of the principles of geology in the solving of environmental problems. Hydrology – The science of applying engineering techniques to the properties of the earth's water, especially its movement in relation to land. Biological oceanography – The study of how organisms affect and are affected by the physics, chemistry, and geology of the oceanographic system. Planetary science – The study of planets (including Earth), moons, and planetary systems (in particular those of the Solar System) and the processes that form them. Theoretical planetology - the theoretical study of the internal structure of planets by making assumptions about their chemical composition and the state of their materials, then calculating the radial distribution of various properties such as temperature, pressure, or density of material across the planet's internals. History of Earth science – history of the all-embracing sciences related to the planet Earth. Earth science, and all of its branches, are branches of physical science. History of atmospheric sciences – history of the umbrella study of the atmosphere, its processes, the effects other systems have on the atmosphere, and the effects of the atmosphere on these other systems. History of biogeography – history of the study of the distribution of species (biology), organisms, and ecosystems in geographic space and through geological time. History of cartography – history of the study and practice of making maps or globes. History of coastal geography – history of the study of the dynamic interface between the ocean and the land, incorporating both the physical geography (i.e. coastal geomorphology, geology and oceanography) and the human geography (sociology and history) of the coast. History of environmental science – history of an integrated, quantitative, and interdisciplinary approach to the study of environmental systems. History of parasitology – history of the Parasitology is the study of parasites, their hosts, and the relationship between them. History of environmental chemistry – history of the Environmental chemistry is the scientific study of the chemical and biochemical phenomena that occur in natural places. History of environmental soil science – history of the Environmental soil science is the study of the interaction of humans with the pedosphere as well as critical aspects of the biosphere, the lithosphere, the hydrosphere, and the atmosphere. History of environmental geology – history of the Environmental geology, like hydrogeology, is an applied science concerned with the practical application of the principles of geology in the solving of environmental problems. History of geoinformatics – history of the science and the technology which develops and uses information science infrastructure to address the problems of geography, geosciences and related branches of engineering. History of geophysics – history of the physics of the Earth and its environment in space; also the study of the Earth using quantitative physical methods. History of glaciology – history of the study of glaciers, or more generally ice and natural phenomena that involve ice. History of hydrology – history of the study of the movement, distribution, and quality of water on Earth and other planets, including the hydrologic cycle, water resources and environmental watershed sustainability. History of hydrogeology – history of the area of geology that deals with the distribution and movement of groundwater in the soil and rocks of the Earth's crust (commonly in aquifers). History of mineralogy – history of the study of chemistry, crystal structure, and physical (including optical) properties of minerals. History of meteorology – history of the interdisciplinary scientific study of the atmosphere which explains and forecasts weather events. History of petrology – history of the branch of geology that studies the origin, composition, distribution and structure of rocks. History of soil science – history of the study of soil as a natural resource on the surface of the Earth including soil formation, classification and mapping; physical, chemical, biological, and fertility properties of soils; and these properties in relation to the use and management of soils. History of topography – history of the study of surface shape and features of the Earth and other observable astronomical objects including planets, moons, and asteroids. ^ "WordNet Search - 3.1". wordnetweb.princeton.edu. ^ "A Lexicon of the Spheres" (PDF). Oregon State University. ^ "ESO 2 Science 11: The Ecosphere and the Ecosystems". Science Helpdesk. This page was last edited on 27 February 2019, at 18:36 (UTC).